This project explores the creation of alternative transitional justice spaces in post-conflict contexts, particularly concentrating on the role of art and the impact of social movements to address human rights abuses. Drawing from post-authoritarian Tunisia, it scrutinizes the work of contemporary youth activists and artists to deal with the past and foster sociopolitical change. Although these vanguard protesters provoked the overthrow of President Zine El Abidine Ben Ali in 2011, the power vacuum was quickly filled by old elites. The exclusion of young revolutionaries from political decision-making led to unprecedented forms of mobilization to account for repression and injustice under the ancien regime. During this process, art served as a medium to create these innovative spaces of deliberation. The study builds on Foucault's concept of heterotopia -- spaces of otherness that are simultaneously physical and mental -- to fuel new insights on the challenges associated with generating spaces of memory and accountability. It is based on over three dozen in-depth narrative interviews with local actors and content analysis of art campaigns and collective action. The findings demonstrate that the emergence of this new fragile spatiality is nevertheless contingent on contested visions and memories of Tunisia's secularist and Islamist political traditions. Kurze, Arnaud. 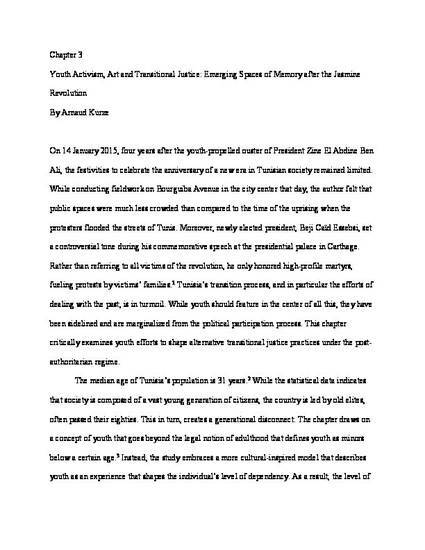 “Youth Activism, Art and Transitional Justice.” In New Critical Spaces in Transitional Justice: Gender, Art, and Memory, edited by Arnaud Kurze and Christopher Lamont, 63–85. Indiana University Press, 2019.